→Poulan Pro PR500N21SH Review: High Maintenance? Poulan Pro PR500N21SH Review: High Maintenance? 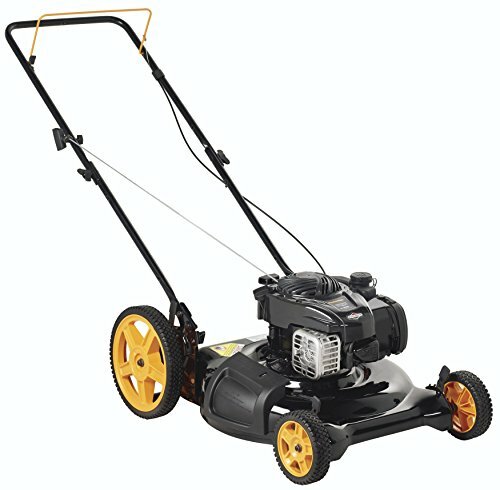 Are you looking for a reliable and sturdy push mower that starts every time without a problem? If so, the Poulan Pro PR500N21SH lawn mower may be worth checking out. With a strong 140cc gas Briggs and Stratton engine and steel housing, this mower is built to last. Do I mix the oil and gas? Can I change the wheel height? What about the cutting heights? How does it do on inclines? How do you change the oil? What’s the difference between the mulching and mowing? How does it work on dead leaves? Does it work well on different types of grass? How do I safely store this mower for an extended period of time? Do the wheels use bushings or bearings? Is Poulan Pro a good brand? When you unbox this machine, all you really need to do is install the handle. It snaps in place, and the rest comes in one piece. Get your handle on, add oil and gas, and start it up! This mower comes with one full bottle of oil, and you can use it all right after assembling the unit. After you add it in, make sure to check the level to be sure the reservoir is not over or under-filled. Usually that initial bottle is just right to get you started. If you need more oil either at first or in the future, you can pick up any generic mower / lawn tractor oil, and it should work just fine. The engines in the Poulan Pro 500E series all use regular gas with a separate oil reserve. So, unlike many engines, you don’t want to mix the oil and gas together. You can adjust each wheel individually to suit your preference. Each one has handle on the corner to adjust its height up or down so it’s right where you want it. This Poulan Pro offers five different heights at which to cut the grass, which is a good value considering the price tag. Many mowers in this range only give you two to four different settings. There are different levers for the different heights, one on each wheel. While this is a bit less convenient than having one lever to adjust the height, you probably won’t be changing it that often. If your yard is very uneven, it might be best to adjust the back wheels a little higher than the front so you can get better traction on the tough spots. As for how high or low you should have the mower set, experts generally recommend cutting no more than 1/3 of the total height of the grass each time. So, if your grass is three inches tall, they say cutting no more than one inch off to start will keep it healthiest. It’s said if you cut off more than this, you could stunt the development of the roots and the growth of new grass. If you’re cutting for the last time of the season, it’s recommended to mow more frequently instead of cutting it lower in one pass if you want it shorter for the winter time. Two inches in height is the ideal recommendation for the off-season. That leaves room for new growth after its dormancy is over and also reduces the chances of bacteria or fungal growth that may make your lawn look less than optimal. If you really want your lawn to shine, try applying a slow release fertilizer with a 10-10-10 ratio at least a few weeks prior to the final cut of the season. While your yard won’t use all the fertilizer right away, it will stay in the soil to help boost root growth throughout the winter. After the winter is over, make sure you don’t cut it too soon. Make sure you first see signs of new grass growing. Before you mow it for the first time, let it grow until it looks a little ragged, then take 1/3 of its height off the top. Then, with subsequent frequent cuts, you can have it looking great and the length you want in no time. This Poulan Pro has a gas engine with a pull start, much like other walk behind mowers on the market today. When you get it, make sure to put in the oil and gas, push the prime button, wait a few seconds, then just pull the cord to start it up. If you’re especially tall or short, adjustable handles are a definite plus. However, that’s not an option on this mower. In one review, a user said he’s 5’9” tall, and the handles are at a very comfortable position for him. If you’re significantly taller or shorter, they may not be as comfortable for you. It’s important to note however, that while the handles do not adjust in height, there are two different selections for the angle. This will help a lot if you’re shorter or taller than average. Is it self-propelled? While it’s not self-propelled, most users don’t seem to mind this missing feature at all. Even though the housing is steel, user reviews say it’s still easy to push and pull, especially on flatter ground. According to the manufacturer, it’s listed as having a manual power source because it’s not power-driven but user driven. While some mowers handle more difficult on rough terrain or on inclines, the PR500N21SH has very large rear wheels that actually make it easier. One user review said it’s the perfect ditch mower. Another says he has a gradual incline on his property, and he uses this mower on it regularly with no problems at all. To change the oil in this model, you need to tip the mower on its side. Select the suitable oil from the chart below. The temperature on the left is the ambient temperature the machine will be operating in as recommended by The Society of Automotive Engineers oil grades. While using your mower on a regular basis doesn’t seem like much fun, even if you’re out in the warm sunshine, there are some things you can do to make it seem like less of a chore and make it easier on you. Ever get tired of bending over to pick up branches and sticks so you don’t mow over them? Some people carry one of those grabbers you can buy to get things off of high shelves and repurpose it to pick up lawn debris instead. Might be fun and could just save your back. One thing you can do is see how fast you can mow it and still have it looking great. If there are different members of your family that do the job, this can be turned into a fun race – just make sure you keep it safe. Another thing that might be fun for the family is to mow interesting patterns into your yard. Try a smiley face or making alternating stripes for some variety. This should put a smile on your family’s faces and maybe even get the neighbors talking. If you want a more intricate pattern, make a rough drawing of it on a piece of paper prior to starting up the engine. Experts agree that changing up your mowing directions encourage better growth. What a fun way to do that! While you may be tempted (at least partway through the year) to hire out your lawn mowing work, doing it yourself is so much less expensive and can actually be turned into a fun chore involving the whole family. Most yard services charge between $25 - $50 each time including trimming, mowing, edging as well as blowing any clippings away from your drive, walk, patio and curb. Why not save that and teach the kids how to make a boring chore more interesting? Luckily, this Poulan offers both of these features in one machine, so it’s up to you which you’d like to use. Many people prefer mulching because it cuts the grass particles very fine, and they get pushed down by the soil. There, they decompose and add nutrients back into your lawn. You can use the mulching feature on both leaves and grass. If you don’t like the look of cuttings / mulch in your yard, you can always use the mowing feature instead. This still cuts the grass, but instead of mulching them, they’re thrown from a chute on the side of the mower. The great news is this machine comes with the mulcher attached as well as a cover you can close if you don’t want to use the mulching feature. According to user reviews, The Poulon Pro 500E series, which includes this model, works fantastic for mulching leaves. In fact, one user review from a man who owns one says he likes it so much that he ordered one for his daughter and son in law for their birthdays, and they love it as well. If you have a yard composed of different types of grass, this versatile machine works quite well. You can mow over thin or thick spots and even over small twigs with no problem. Of course, it’s always easier to mow a dry lawn. If your lawn is especially wet, you might to need to go over it twice, as with any mower. There are very few if any climates where you’ll be using your outdoor equipment year round. If you live in a very temperate climate like some of those in Florida and California, however, you may find yourself never putting up your tools for the season. When you start and stop cutting your grass depends on many factors. One is the type of grass you have growing. Bermudagrass and buffalograss are both warm season grasses that go into a dormant period later in the fall, so you would cut them for the last time just before that happens, usually in late October. If you have something like Kentucky bluegrass or fescue, you can expect to mow later in the year, as they are known as cold season grasses and have a longer growing cycle. In this case, you may have to still mow your yard as late as November or December. For most areas of the U.S., you can expect to start mowing in May and continue through at least September. 1. Drain the oil while the engine is warm and replace it with clean oil. 2. Drain any remaining fuel from the tank after you’ve used it for the last time. 3. Start it up, and keep it running until the carburetor and fuel lines are empty. 4. Fill it up with new fuel just before you use it again. One important thing to note is that you should never use carburetor or engine cleaner products in the fuel tank to prevent damage to the engine. However, you can use a fuel stabilizer to the fuel tank to prevent gum deposits from forming during the time you store it. If you decide to do this, run the engine for a minimum of ten minutes after you add the stabilizer so it can reach the carburetor. If you do use stabilizer, then you don’t need to empty the gas tank prior to storage. If you want to give your machine a tune up and replace the spark plug, here’s how: Remove the spark plug and pour an ounce of oil through the hole in the cylinder. Then, Pull the starter handle slowly to distribute the oil and replace with a new spark plug. Speaking of storage, if you plan to cover your mower, always wait until it’s cold to do so. Covering it while warm will encourage condensation. To clean your Poulan Pro PR500N21SH, scrape any built up grass from the underside of the deck. You can also clean the engine to keep debris from accumulating on it. It’s not recommended to spray the mower with a hose to clean it unless the carburetor, muffler, air filter and electrical system are covered, as water inside the engine can shorten the life of the unit. While most users aren’t concerned with such technical details, it’s good to know the ins and outs of any tool you use, and it may affect what type of maintenance it needs. In this case, the plastic wheels have bushings. This seems to work great for most people who own this mower, but if you have any problems, one user says he shoots some WD40 on the wheels from time to time to keep the clippings or mulch from accumulating on them or gumming them up. The short answer is yes. Poulan is a mid-priced subset of the Husqvarna company, which has long history of manufacturing yard and outdoor tools and equipment including leaf blowers, chainsaws, mowers and the like. The more upscale Poulan Pro line is a more recent addition and is easily identifiable by its gold and black color scheme. While most users who own this Poulan love it, there are a few things you’ll want to know before purchasing one for yourself. First, the PR500N21SH is not self-propelled. This doesn’t seem to be a concern for most owners, as they say it’s still very easy to handle. Second, the handle height isn’t adjustable. This won’t matter to most of us, but if you are particularly short or very tall, this might be a concern. If you’re anywhere near “average height”, you shouldn’t have any problems with it at all. The good news is that there are two angles to choose from, so adjusting that will definitely help if you’re taller or shorter. The third thing to know is that it does not come with a bag to catch the grass clippings. While most experts agree that mulching is a healthier option for your lawn, some users still desire this feature. Overall, the Poulan Pro PR500N21SH lawn mower, part of the 500E series is a great investment. Whether you have a lot of yard to mow or just need a really sturdy and reliable machine for a quick, small job, this one fits the bill. With solid construction and easy maintenance, it will keep your lawn looking great for years to come. If you’d like to get one, Amazon has some great prices right now.